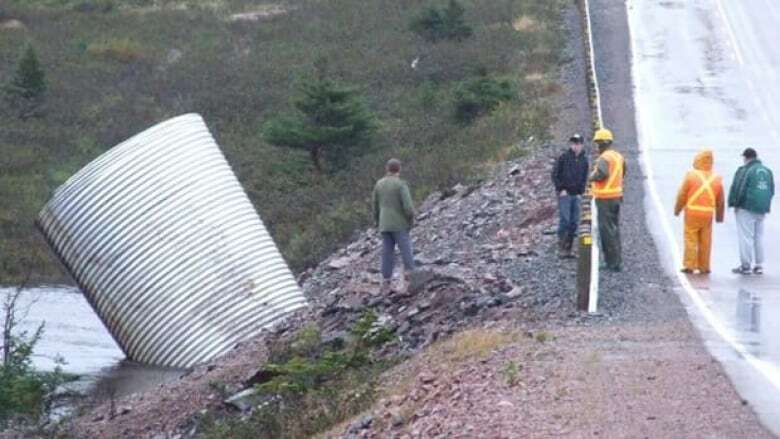 The mayor of Marystown says damage caused by severe weather shows the province failed to adequately repair roads after Hurricane Igor hit last year. The mayor of Marystown says damage caused by Monday’s severe weather shows the province failed to adequately repair roads after Hurricane Igor hit last year. Sam Synard said he wasn’t surprised to hear that some roads and culverts were washed out again on Monday by the remnants of Hurricane Ophelia. "It's somewhat frustrating and sad really that we didn't learn what we should've learned from Igor and that is: that we need to be better prepared and a part of that better preparedness is having an improved and increased capacity in infrastructure," said Synard. Ophelia, which was downgraded early Monday morning from a Category 1 hurricane, drenched eastern Newfoundland with heavy rain. One lane on Route 210, the Burin Peninsula Highway, in the area of Red Harbour Hill has sustained shoulder and asphalt damage. Two-lane traffic remains in place. A local road in Trouty has sustained damage and is impassable. The road is known locally as ‘the road in around the pond’. Transportation and Works staff are onsite and assessing damages. Synard said he's been telling government officials that building infrastructure that's the same size as what was destroyed last year was a mistake. "I'm just stating the obvious. If a hurricane blows through and knocks out culverts that are some four feet in diameter, it might be a better idea to put them back six feet in diameter, or something [with] increased capacity," said Synard. Synard said if governments do not install better systems, people can expect to see the same roads and culverts wash out again next year, and the year after. Despite Synard’s criticism, the province’s transportation minister is defending the condition of the roads in the Trouty area. Tom Hedderson said some damage is inevitable when a severe storm hits. "When you get a significant flow as we've got [Monday], we do expect that there will be some damage, and hopefully damage that we can mitigate very quickly," he said. He it is not fair to say that damaged infrastructure was replaced with the same things that were there before. Hedderson say larger culverts were put in place in some areas damaged by Igor.